Google have added an option to add videos to Google Maps. The new option has been added to the 'More' button alongside the Wikipedia and Panoramio options. If you select the 'Videos' option thumbnails of YouTube videos are added to the map. Clicking on the thumbnail opens the video in an information window. it's only at the moment the maps.google.com you see this options. if you go to maps.google.dk or maps.google.se you will not see this video options for YouTube. However danish geotagged videos shows up on the dot com domain. The Google Earth Youtube layer shows much more content for example over denmark. Thanks for the update Soren. Coincidently I was browsing Copenhagen when I noticed the video layer appear. Interesting feature. However I wonder which criteria is retained to select a particular video. The video would have to be considered in a particular context. 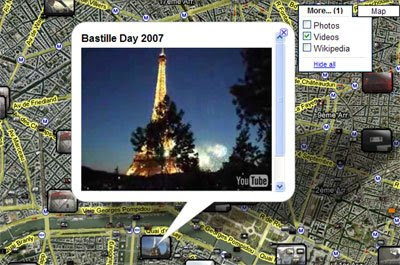 For instance in our website users can attach movie extracts to filming locations they map. An example here.